Hi everyone! Today, I don't have enough time to post a pattern, so I'm posting a preview of the pattern that I will post next week. This is another outfit for Barbie and is from Back to the Future. If you haven't seen this movie (it is from the 80s) just Google it and you'll probably see a picture of a girl wearing a dress that looks like the picture below. 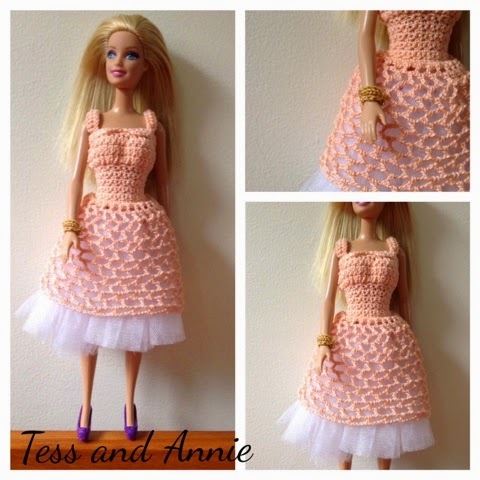 For this dress, I made a top, crocheted a lacy skirt, and put one of my Barbie Romantic Tutu. It makes the dress fuller and also makes it a little less see-through. I also crocheted a gold bracelet with metallic gold thread. Enjoy the preview! I look forward to sharing the pattern with you next week!